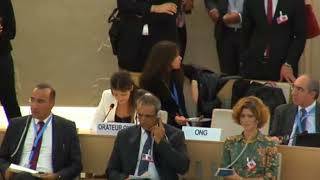 International Lawyers.org and Geneva International Centre for Justice would like to bring to the attention of the Council that Israel has failed to ensure equal enjoyment of socioeconomic rights between Jewish and non-Jewish populations in all areas under its effective control. Israeli restrictions on the movement of people and goods, the discriminatory zoning and planning regime, control over Palestinian economy, exploitation of Palestinian natural resources, rigorous sanctions, military actions and the blockade on Gaza have devastated Palestinian economy and caused lasting socioeconomic hardship and a protracted humanitarian crisis in Gaza. Discrimination against Palestinian citizens of Israel in the job market shows that the Israeli apartheid system traverses the Green Line. Palestinians are deprived of their most basic rights as Israel continues its illegal settlement and annexationist activities and destruction of Palestinian property unabated. As part of its settlement policy, Israel has created segregated physical spaces along ethno-national lines. Through its laws and practices, Israel has not only gradually expropriated Palestinian land and property and forcibly displaced and enclaved Palestinians, but has also entrenched the segregation of these enclaves from Jewish Israeli areas inside Israel and occupied Palestine. This segregation is underpinned by the discriminatory allocation of infrastructure, services and access to resources. Some Israeli practices amount to crimes against humanity. We are convinced that only an end to the occupation and the realization of Palestinians’ inalienable rights, including self-determination, can bring about an end to the blatant violations and substantive change towards equality and just peace.